In April 2011, Edinburgh's music venues were host to Haddowfest 2011, and in the smoking shelter out the back of The Liquid Room, edRock.net recorded live acoustic performances from some of Haddowfest's performing bands. Hear the full coverage on the Day 2 webcast, and stream or download the individual tracks for free from bandcamp. When drummer Col McGregor’s Edinburgh band Frantic Chant were booted off of a charity compilation album for Yorkhill Hospital in Glasgow that had decided to become exclusively Glaswegian, he decided to take doing his bit into his own hands. Together with Dom Holt of newly formed Leith-based Youngteam Records, Col has put together a compilation album of twenty-one tracks from Edinburgh-based bands. 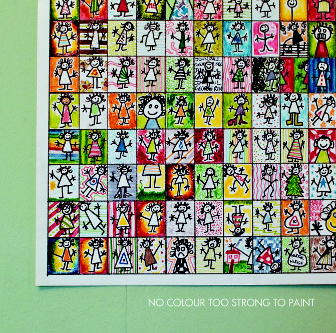 The profits from the sale of the album, entitled ‘No Colour Too Strong to Paint’, will be donated to The Sick Kids Friends Foundation, the registered Scottish Charity that supports the Royal Hospital for Sick Children in Marchmont. The album title comes from a letter written to The Scotsman newspaper by Dr John Smith in 1859. The letter began "No colours are too strong to paint the sufferings of young children amongst the lowest and poorest classes of the population, when afflicted with disease." The cover artwork is produced by Nick Paul and the album was mastered by John Durnan, who also contributed a track. The album will be available to download from “all the major online retailers” [iTunes, and, I guess, Amazon? eMusic maybe] for £6 from 7 May 2011. There will also be a limited edition CD of the album on sale for this one night only. To mark the occasion, several of the participating bands will be performing at Maggies Chamber at The Three Sisters, Cowgate, Edinburgh, the evening of the launch. This launch gig is being organised by Ginger Music Promotions, and has almost sold out! Which is excellent news for Sick Kids, as the profits from the gig are also going to the charity. Tickets are no longer available in advance, but a limited amount will be sold on the door so get there early if you don't already have tickets. If you don't manage it and still want to get the limited edition CD on the night it is released, there is one other option. edRock.net is presenting another event that will also be selling the album on its launch night. At Sneaky Pete’s, just a few doors down from Maggies Chamber, Brain Storm 3 will take place. This is the third in a series of alt-rock live music events coordinated by noise-popniks Scrap Brain and sponsored by Bainbridge Music and Great Junction St Music Studios. 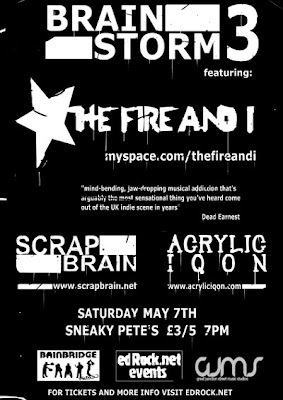 In addition to Scrap Brain, who appear on the No Colour... album, the night will feature Bathgate duo The Fire and I and Glasgow pop-punks Acrylic Iqon. The gig starts at 19.00 and tickets are available from TicketWeb for £3. After the launch, the album will still be available online, and rumour is that there will be more promotional gigs to come. You can follow their progress and hear about upcoming activities on the No Colour Too Strong To Paint official Facebook page.